St. Mary's Hospital commissioned Amri Studio to create a Donor Wall that would also form an inspirational waiting room area in their Wiegand Heart Center. 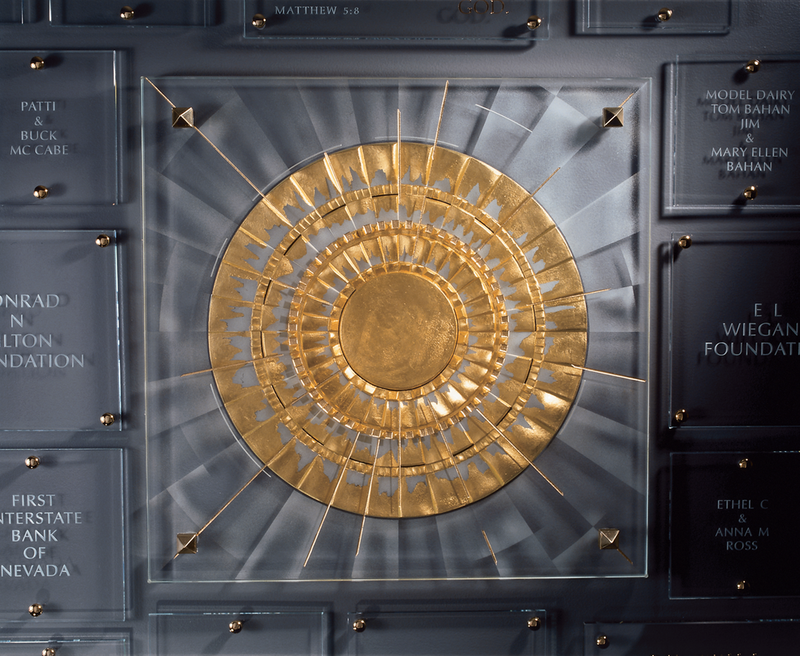 A 32-inch square of thick polished crystal with a gold-leaf sunburst forms the central artwork. Crystal plaques containing donor names and inspirational quotations radiating out from it. Undedicated blank plaques invite future donor participation while keeping the wall looking beautiful and complete. Annually updated with Amri Studio, Donor Walls such as this can display from 120 to 300 names and are both updateable and expandable. Beautifully detailed and radiant, the sunburst is deep carved on both sides of the glass, gold leafed, and delicately etched and frosted. The image subtly expresses the "Son of God," source, creation, fulfillment, protection and light. As the sun radiates warmth, so does the heart, which is the symbol of true love, charity, understanding and piety.